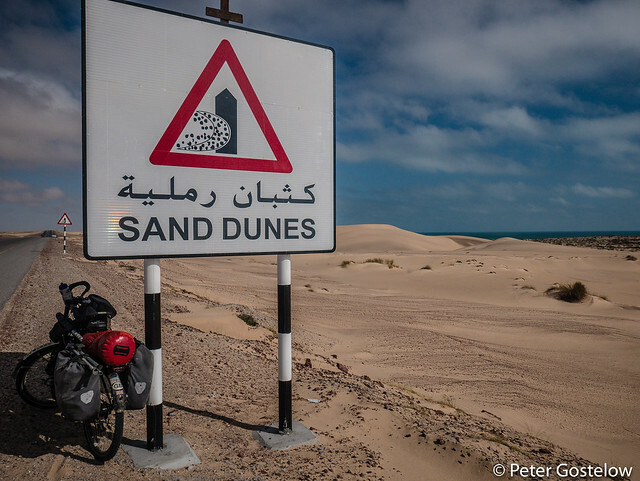 I shall start where I left last time, which is somewhere in the Omani desert around about Christmas time. 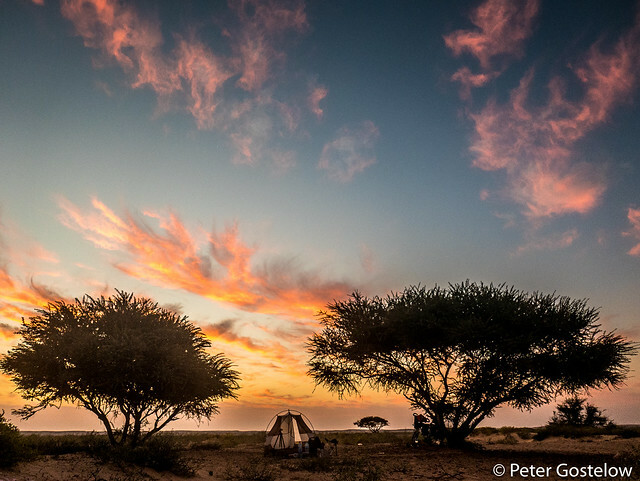 No real festive spirit in this part of the World, just a lot more beautiful camping spots, mountain climbs, historical towns and memorable encounters to enjoy as 2015 came to an end. 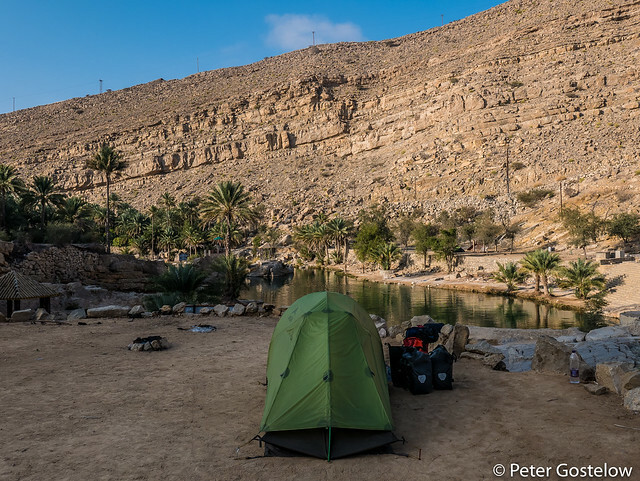 It’s hard to pick a favourite camping spot in Oman as there have been so many. 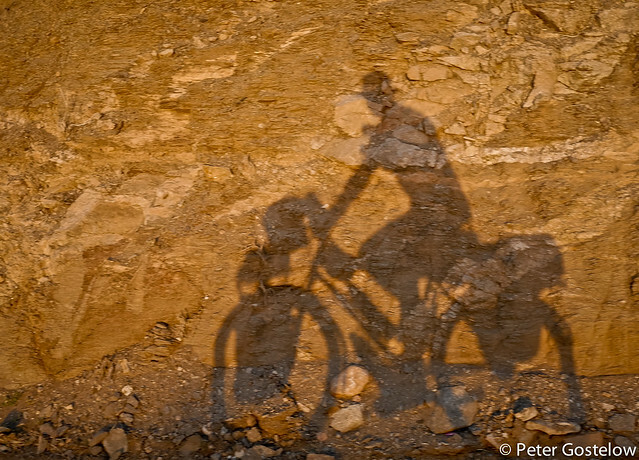 I sometimes pulled off the road before sunset, or waited till I found what was going to be the best place to sleep before it became too dark to see. As the weeks went by I became less concerned about hiding myself from the road. 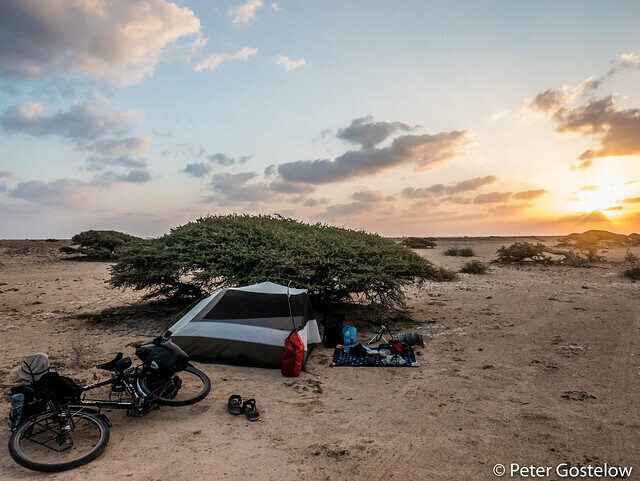 Camping in Oman is as stress free and safe as I recall it to be in Japan, where I first cycle toured over ten years ago, except there I would never be very far away from people. 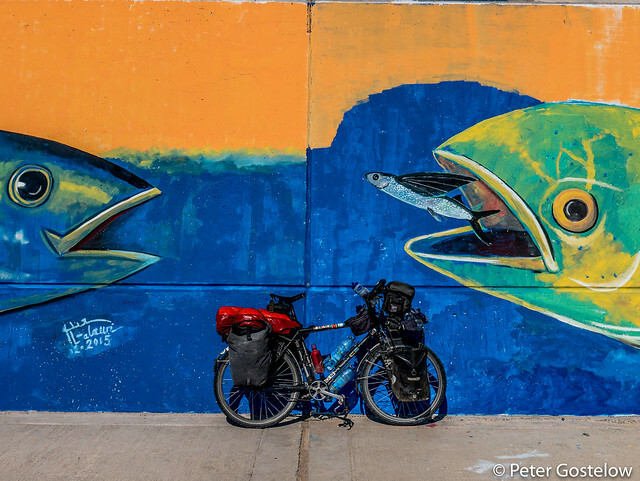 Eric and Amaya are well-known in the cycle touring community, posting lots of useful information online for fellow cyclists. 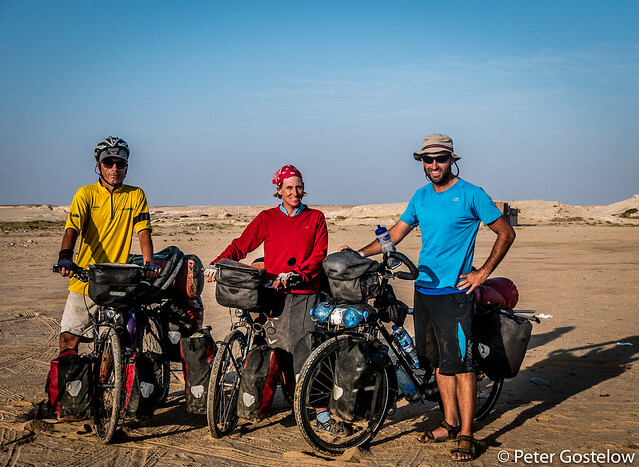 They’ve been on the road continuously for almost 10 years now and Oman is their 100th country visited to date. Having been in contact over the years it was a great opportunity to finally meet up with them in person, share some stories and camp together for the night before parting in opposite directions (they were headed south) the next day. 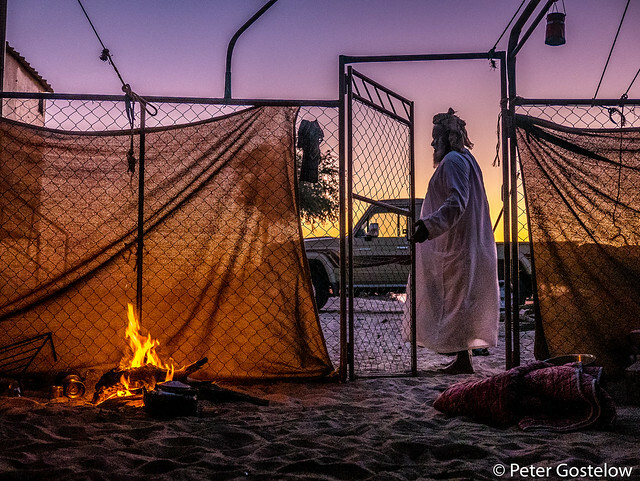 An equally memorable encounter, shortly after saying goodbye to Eric and Amaya, was being invited to stay with a Bedouin family in the desert. 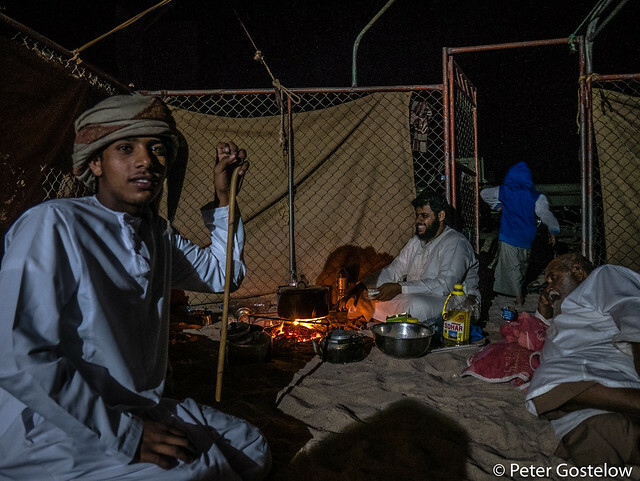 The Bedouin, or Bedu as they are often referred to in Oman, are the original desert-dwellers of the Middle East and North Africa. 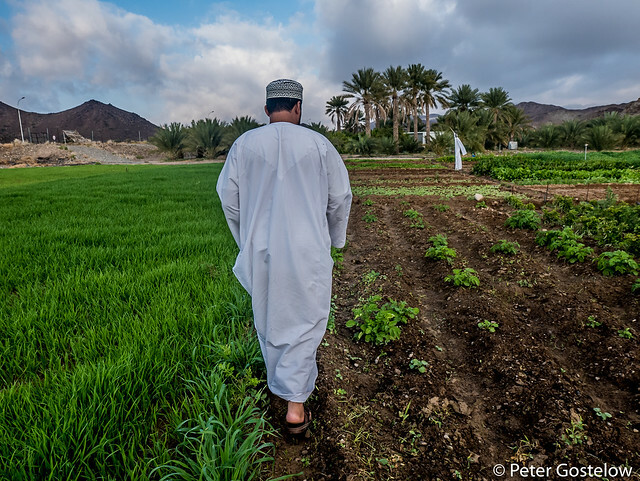 In Oman, like elsewhere, many have given up their desert lifestyle by moving to towns. 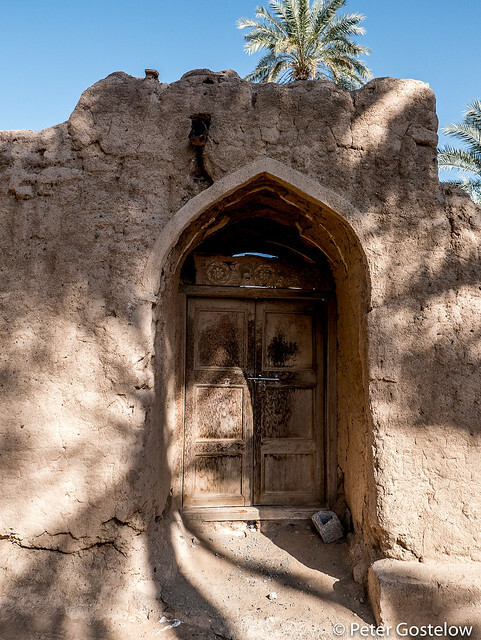 Others prefer to hold onto their nomadic traditions, opting for a lifestyle that combines living somewhere between the two. Mubarak, pictured at the front here, was driving back out to the desert from his town house when he passed me on the road. He stopped and we chatted for a short time in simple English. At first I was hesitant to accept his invitation, but then realised such an opportunity might never come again. I was in no rush to arrive anywhere that day. So I loaded my bicycle into his pick-up and off we went into the sands. We only drove about 8km from the road to an area which he said had received rain in recent months. It looked pretty barren to me, but apparently there was good grazing for his camels, which numbered about twenty, and a small herd of goats. 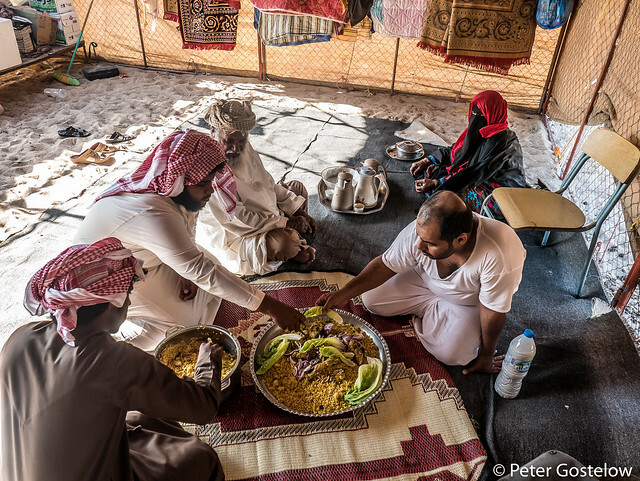 I was soon sitting in a traditional Bedu tent, meeting the family and sharing lunch, and wishing that my Arabic extended beyond more than simple greetings. 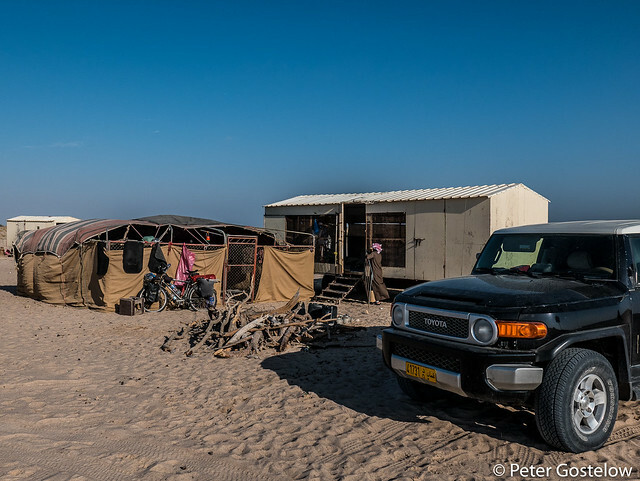 A mixture of old and new: a traditional Bedu tent, albeit with metal poles to hold it up, alongside a less traditional portacabin type mobile home and a Toyota Hummer that belonged to Mubarak’s brother. I slept in the tent. 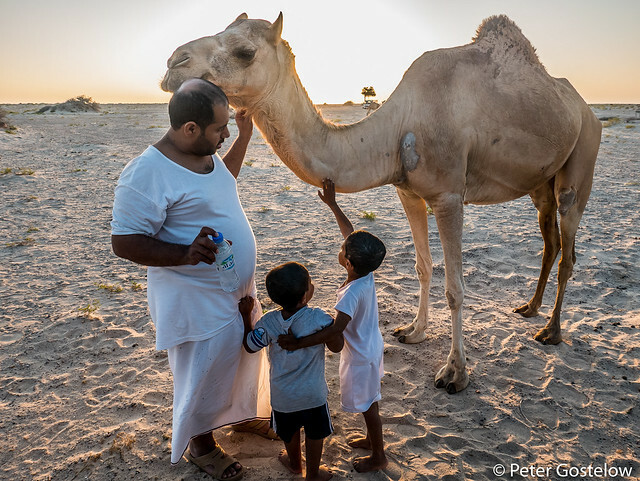 Later in the afternoon Mubarak showed me his beloved camels, which hold special significance for Bedu. 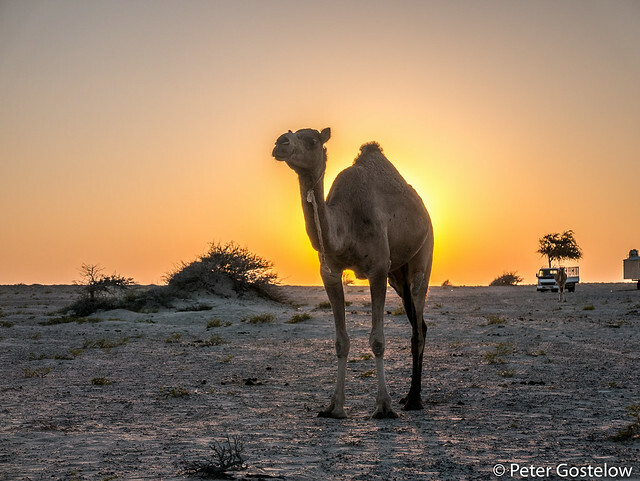 Camels are everywhere in Oman – idly roaming mountain and desert landscapes many miles from any human habitation. Most of these camels, Mubarak explained, would be branded in order to denote the owner. Were a camel killed on the road by a vehicle during the day time the fault would lie with the driver. 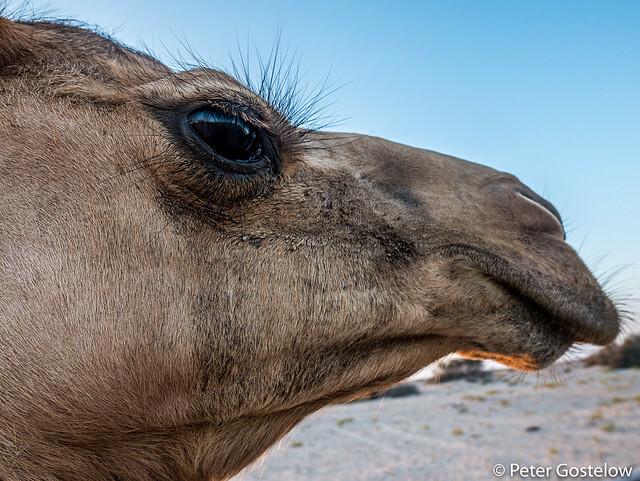 At night the owner of the camel, whoever he was, would have to accept responsibility. 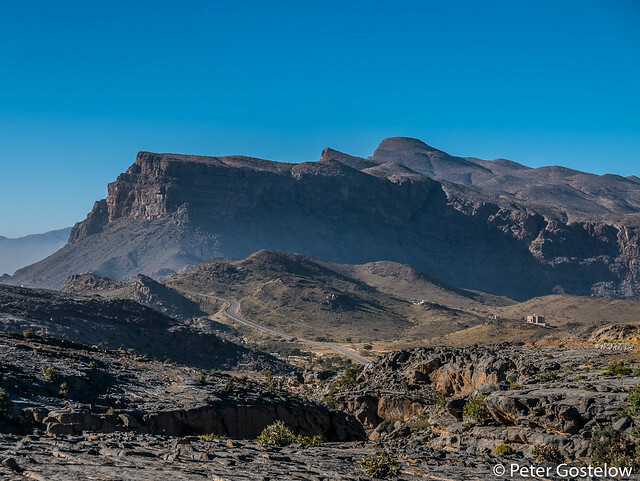 In years gone by camels might have been raided by other Bedu clans, but Oman is a very different country from the time when this man wrote about travelling here. Shortly before sunset Mubarak’s camels were herded together by his two Bangladeshi employees. 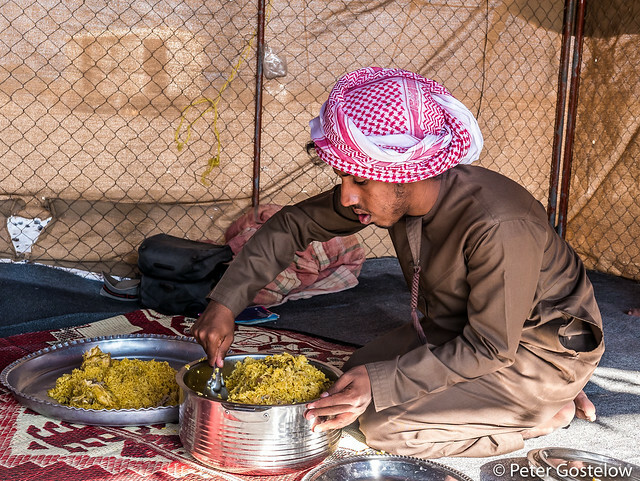 It was they that prepared the food and milked the camels. 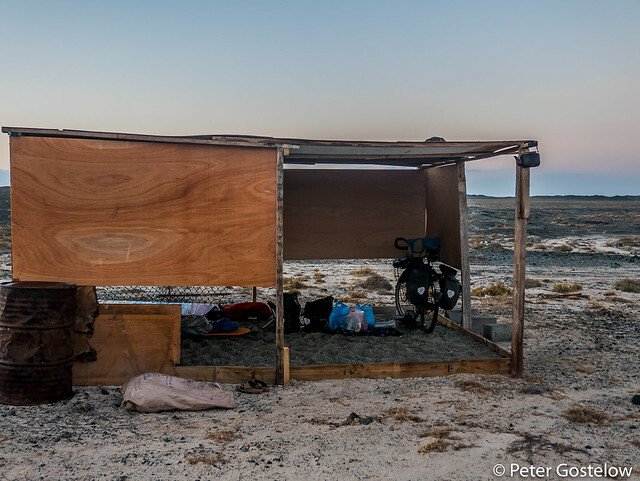 As night fell a fire was lit inside the tent and more family members arrived from a neighbouring camp. Women, long-veiled and wearing traditional Bedu head coverings, sat aside, eating once the men had finished. 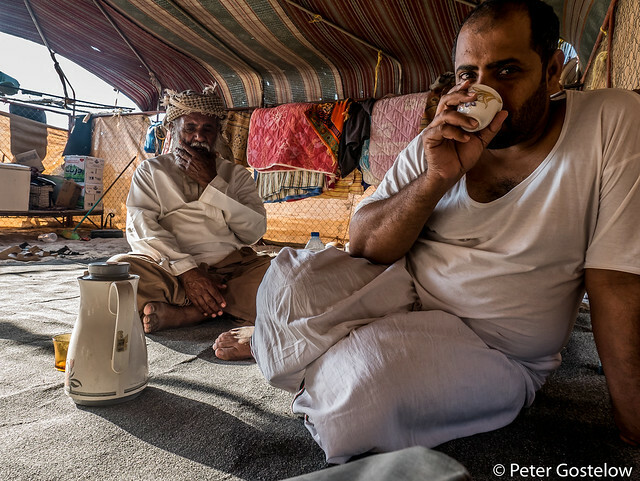 In the morning the fire was lit again and foaming fresh camel milk was brought out. Mubarak later drove me back to the main road. We exchanged contacts and I thanked him for such tremendous hospitality. 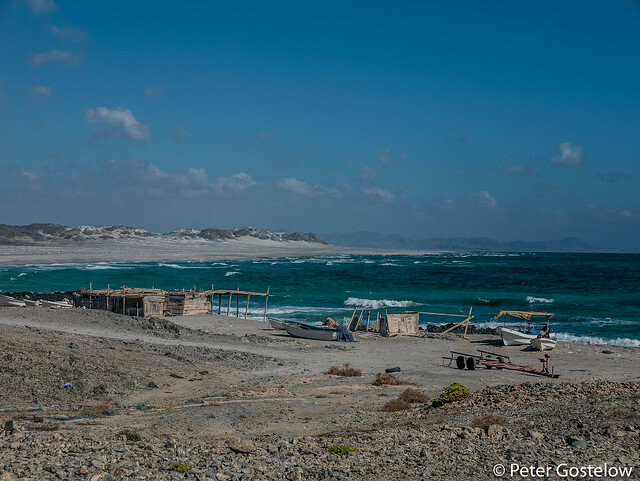 A few hours later I was taking a boat to Masirah Island, which is Oman’s largest Island. 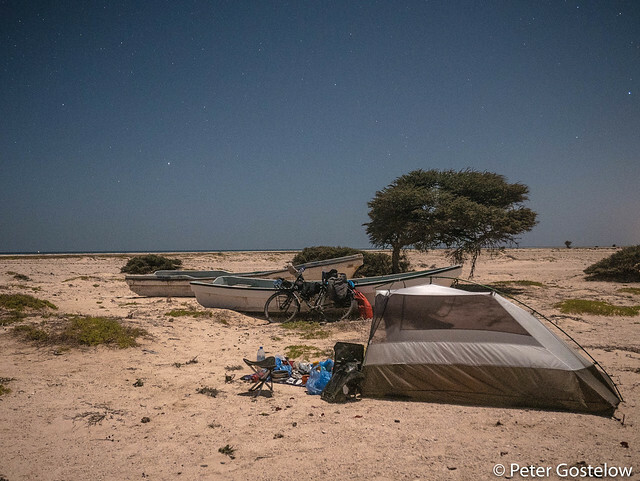 Measuring about 100km from north to south and 15km in width, this truly is a desert island. Windy as well! 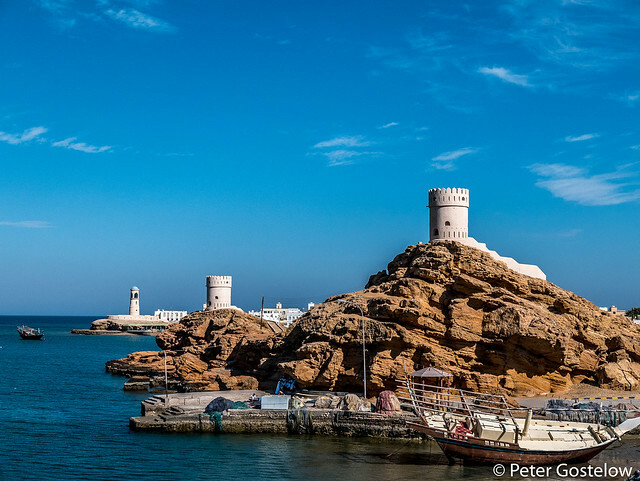 The beaches here and further north along the Omani coastline are popular sites for turtles to lay their eggs, particularly during the summer months. 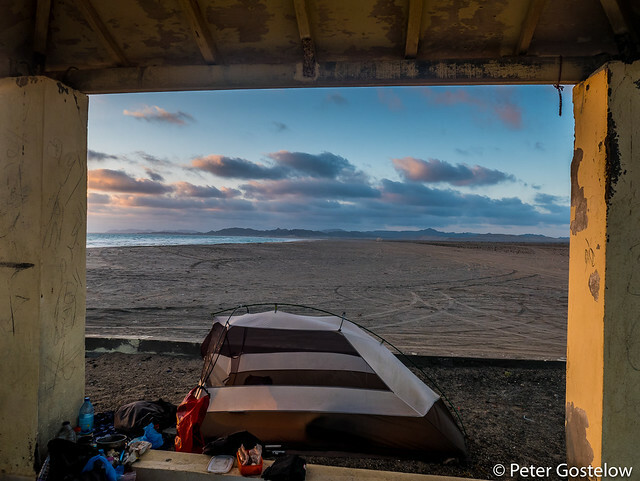 In such open and exposed settings I fortunately found a few makeshift shacks that protected me from the wind. 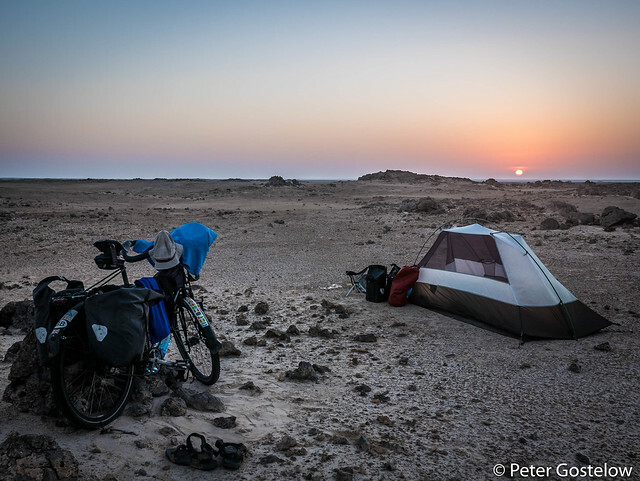 Having camped on sand and been so close to the sea for the previous few weeks my bicycle, and chain in particular, were now suffering somewhat. 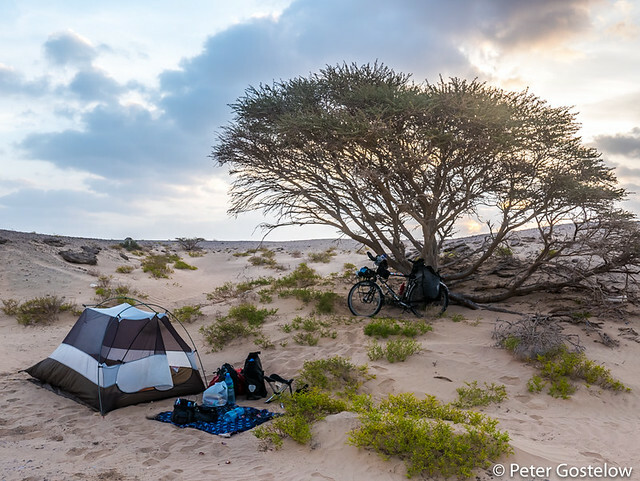 But the sand and wind were to continue for a few more days as I continued north along the coast, camping outside a desert mosque one evening to shelter myself. It was in actual fact the last day of the year and there was no phone network to wish friends in livelier places a Happy New Year. Just like several other years when I have been cycling on New Years Eve, I was fast asleep long before midnight. 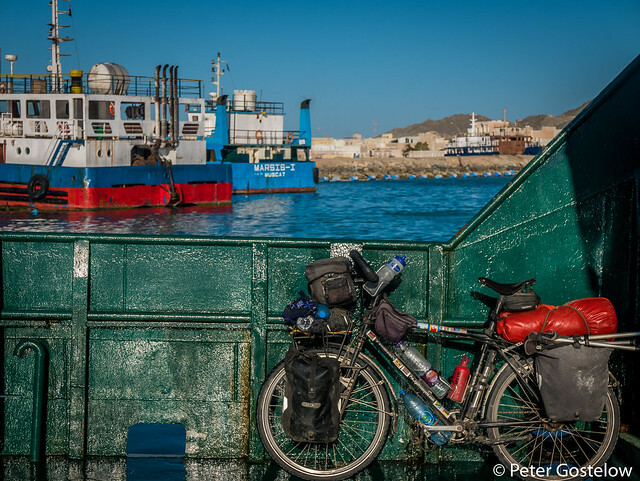 A few days later I reached the scenic town of Sur. 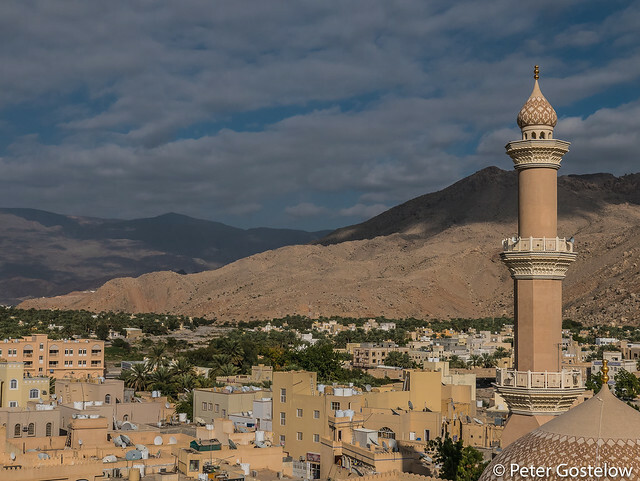 This was the first sizeable town I had been in since leaving Salalah, although seemed as soporific as everywhere else. 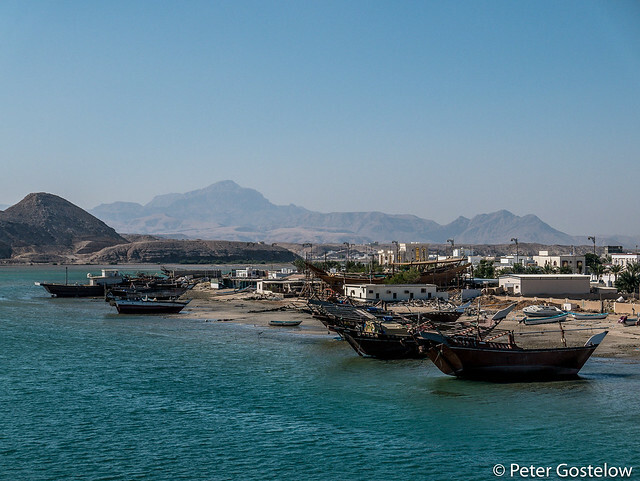 Sur, I had read, is the only place in Oman where traditional wooden dhows are still constructed. 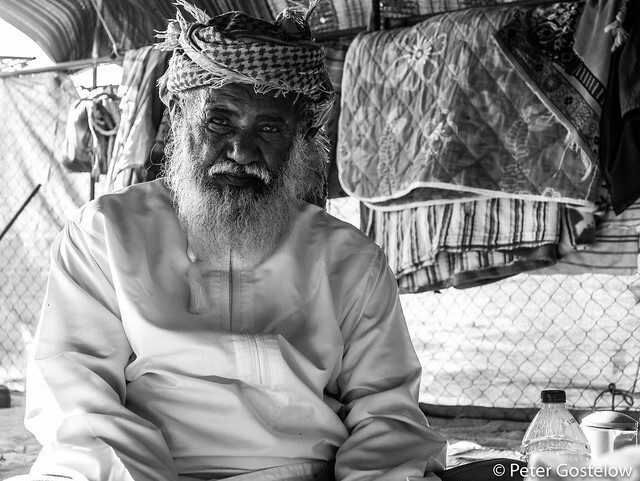 I had anticipated a bustling boat-yard, but found just two dhows in the process of being built. 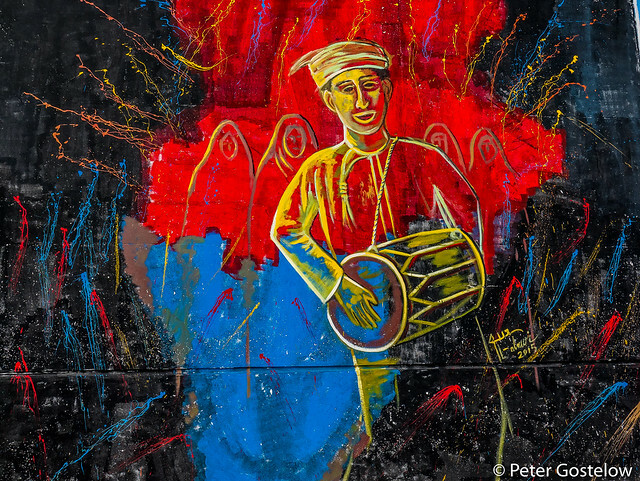 Of more interest, well at least colour, was Sur’s harbour wall, which was in the process of being painted with murals. This was conveniently located opposite the regional police station where my passport was receiving a 30-day visa extension for 20 rial (£35). I returned an hour later to pick up the passport before leaving the coast and heading inland. 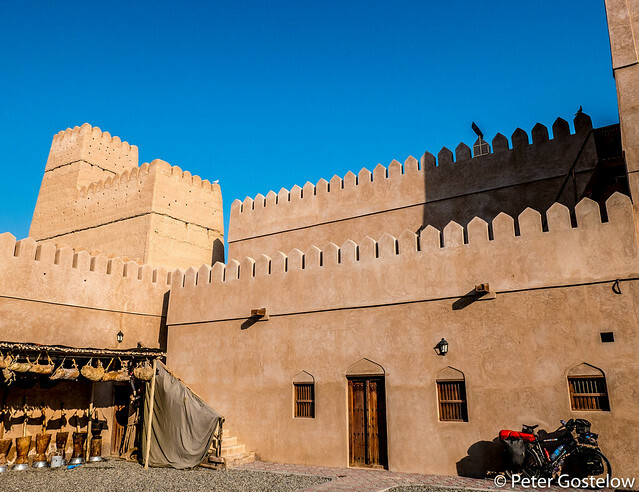 I had the pleasure of sleeping inside the courtyard of a restored castle in the small town of Al Kamil a few nights later. 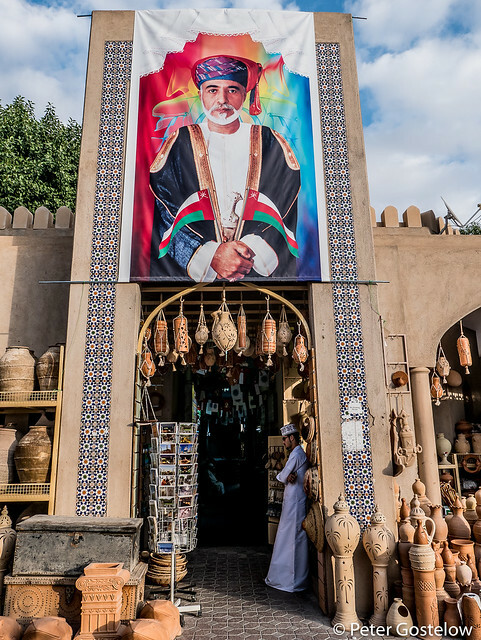 The eccentric Omani owner had decided to turn the place into a museum; well worth visiting should you ever visit the town. 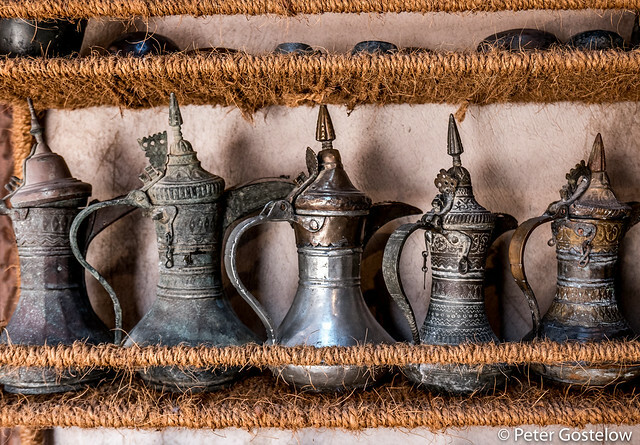 Traditional Omani coffee pots were just some of the many things the Castle museum housed. 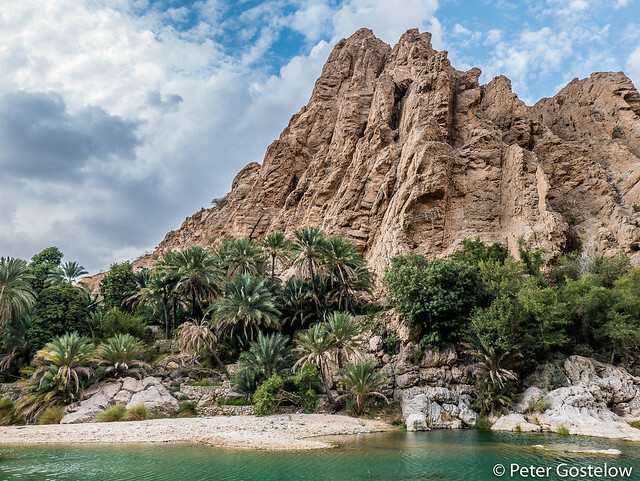 Then it was onto Wadi Bani Khalid, which is one of Oman’s most photographed and famous tourist spots. 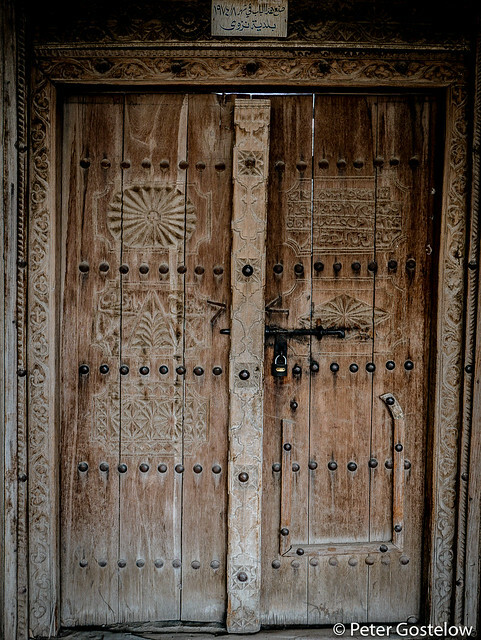 Fortunately I arrived late in the day when most tour groups on day trips from Muscat had left. 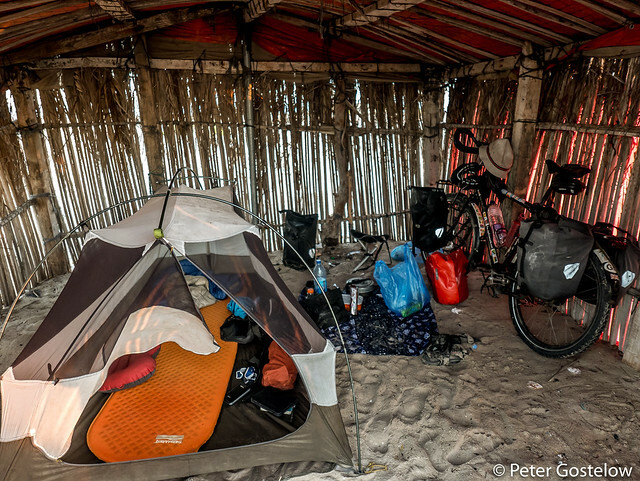 In many places in the World a site like this would either charge for camping or ban it entirely. Such a move would probably evoke a public outcry in Oman. The deep pools of water here were great for swimming. 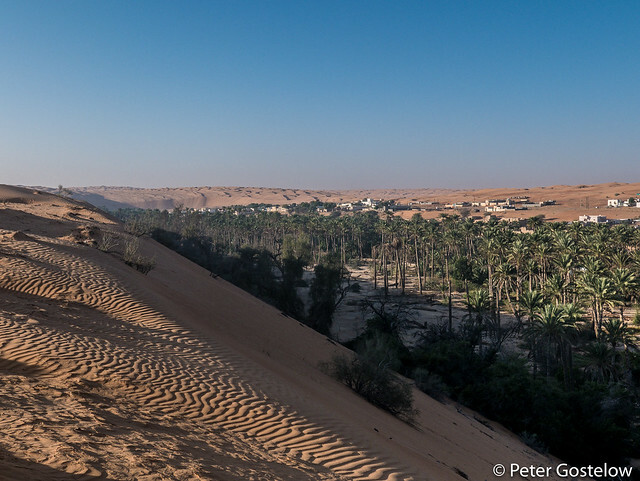 Equally as popular to visit are the Wahiba Sands, an area of Oman that displays the desert at its most beautiful. 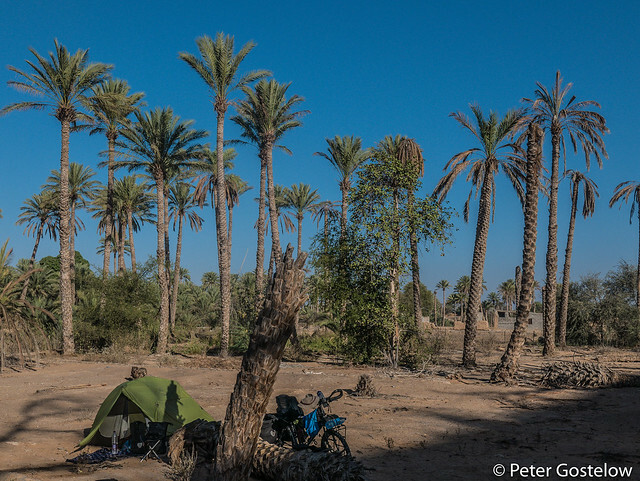 Cycling off onto 100m high sand dunes wasn’t really an option, so I made do with camping in a date-palm plantation where the dunes ended. Magical. 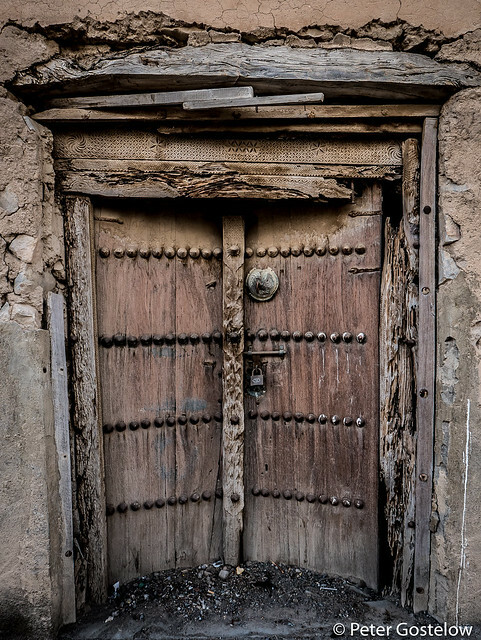 Intricately carved wooden doors remain in many old parts of Omani towns, outlasting the crumbling mud-brick dwellings that have now mostly been abandoned. 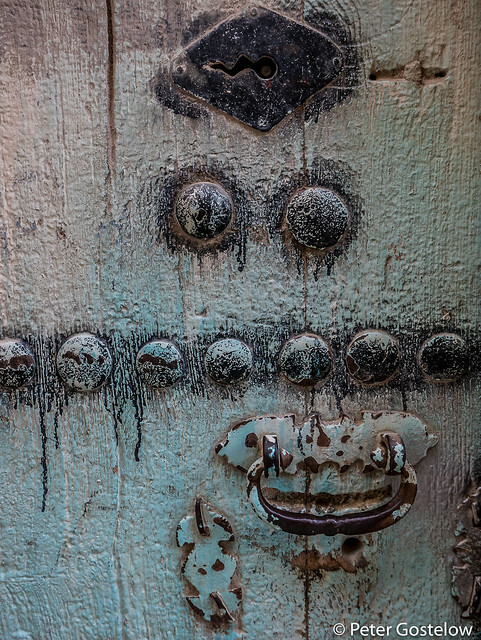 I started seeing and photographing lots of them. 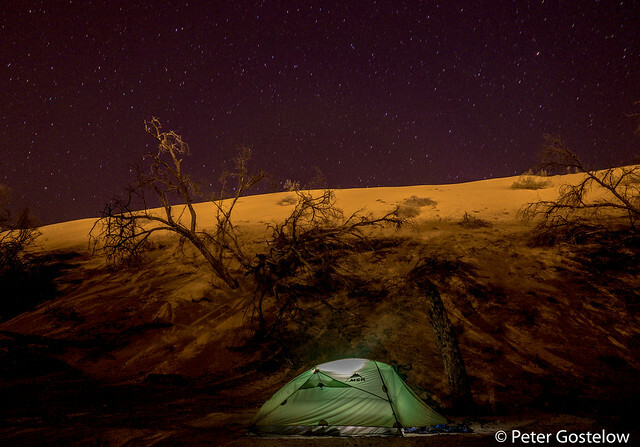 Another memorable encounter was a night camping beside an Omani farm. The green fields appeared like a mirage in the rocky landscape one late afternoon as I was thinking where I might sleep that night. 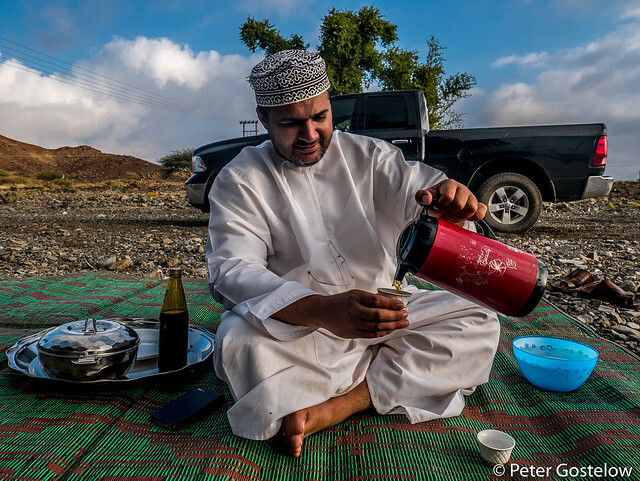 Slowing to see what was growing beside the road, Said, dressed in the traditional long white dishdash that Omani men typically wear, called me over. After a short tour I was soon pitching the tent nearby and joined by Said’s friends. 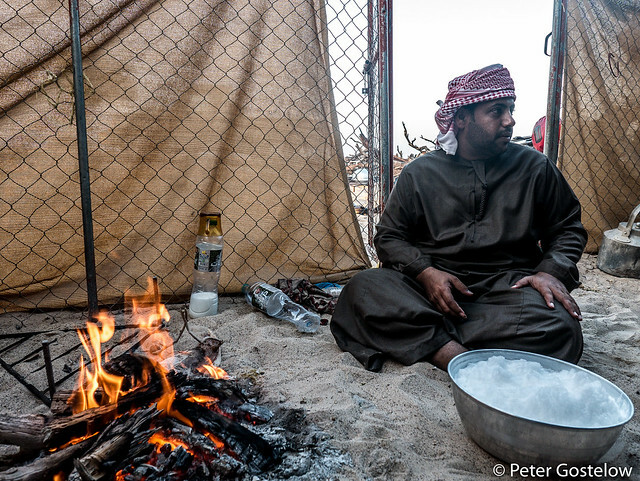 A fire was lit and then an enormous platter of roasted quails was brought out with fresh vegetables from the farm. Said returned in the morning as I was packing up. After a breakfast of pancakes, local honey and coffee I did my best to explain that it was not possible to carry kilos of tomatoes, aubergine and beetroot that were handed to me by one of his Bangladeshi workers. 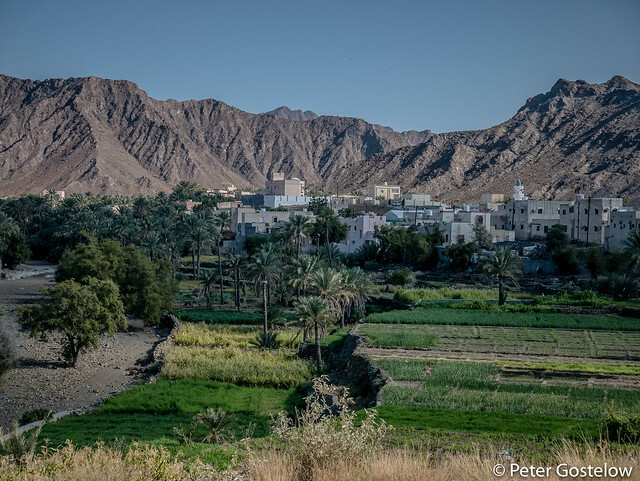 Away from the coast and desert sands I headed towards the Hajar mountains. 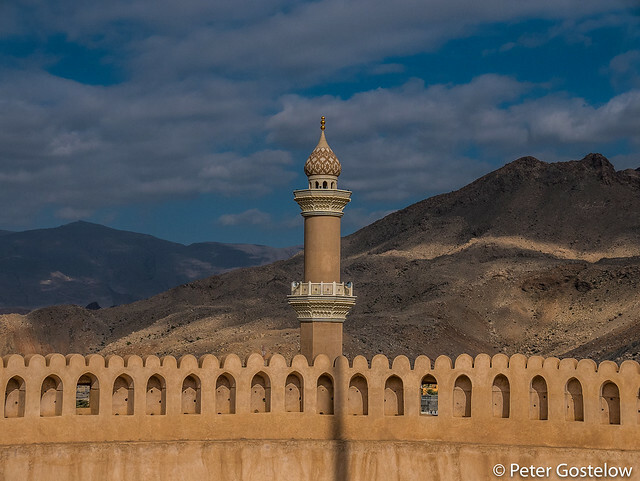 Nestled at the base of the mountains is one of Oman’s oldest towns – Nizwa, famous for its fort and souk. Both of which appear so clean and almost recreated for the likes of tourists like me that they’ve lost the authenticity that the literature about them evokes. Perhaps I should have arrived on a Friday when there is a weekly livestock market. 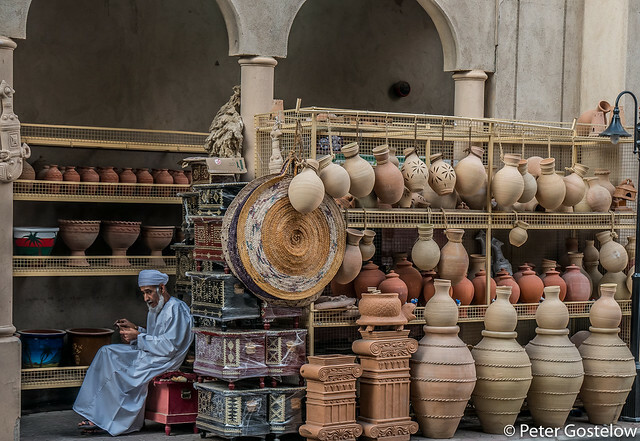 The souk, like souks and many shops throughout Oman, closes between midday and around 1600, which isn’t very convenient. 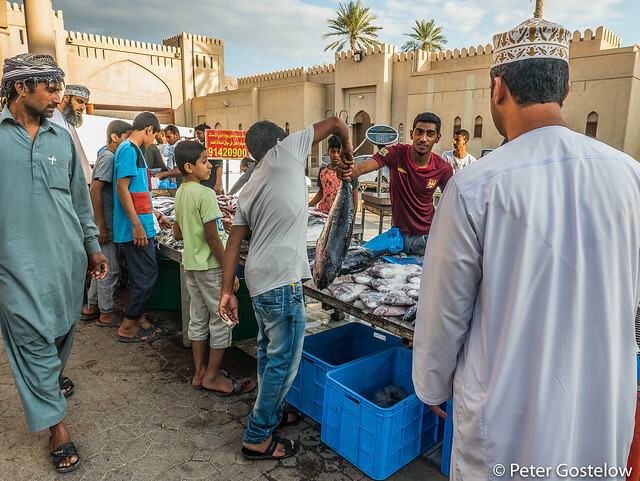 I decided to wait around a few hours for the fish market to open, which was about as lively as the place got. 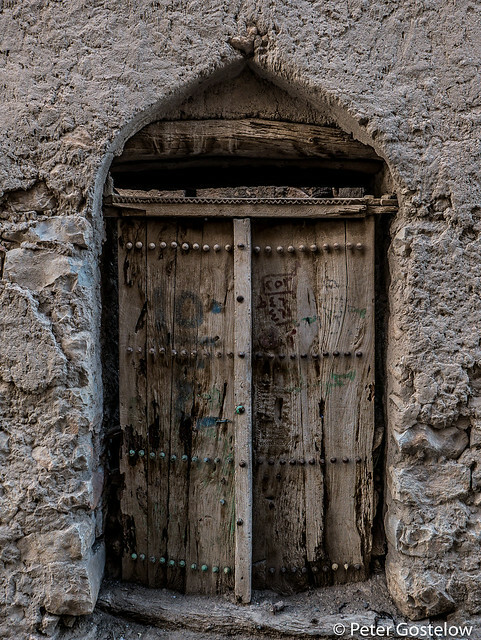 While walking through the empty streets of Nizwa’s old town I met Ali, overhearing a conversation he was having at the time with a Zanzibarian. They weren’t speaking in Arabic, but Kiswahili. 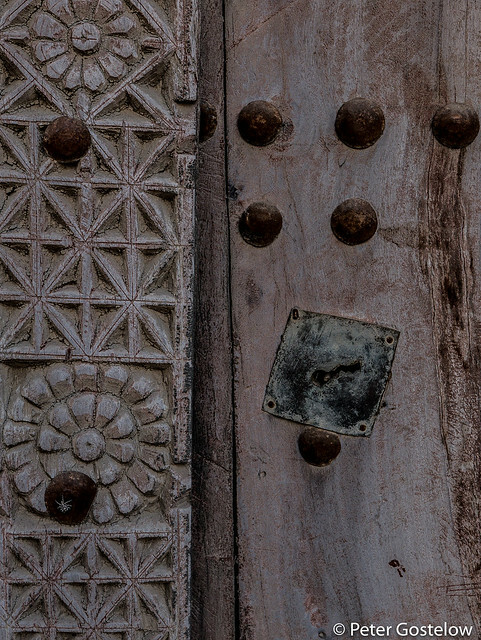 This language isn’t all that foreign to Oman as it once owned the island of Zanzibar, which now belongs to Tanzania. It was a good opportunity to reacquaint myself with what I would classify as my second language. 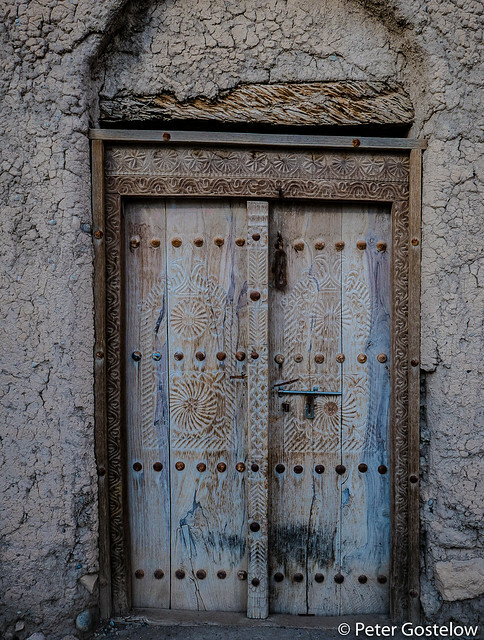 Ali was born in Tanzania, but has lived in Nizwa much of his life. 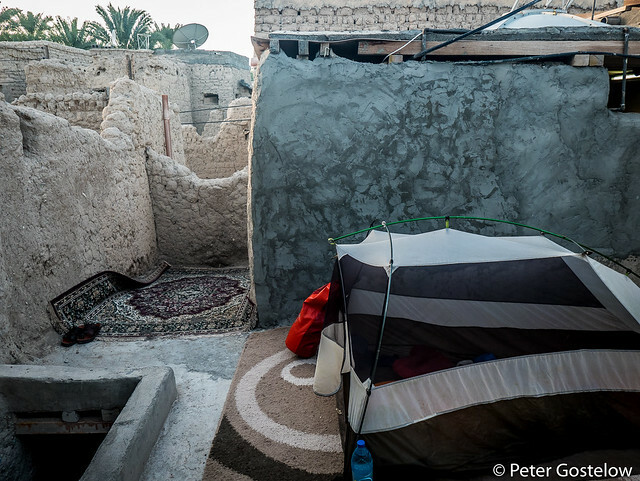 I ended up being invited to spend the night in his home, which turned out to probably be one of the town’s oldest inhabited buildings. Despite the offer to sleep inside, I opted for the mosquito free comfort of my tent. 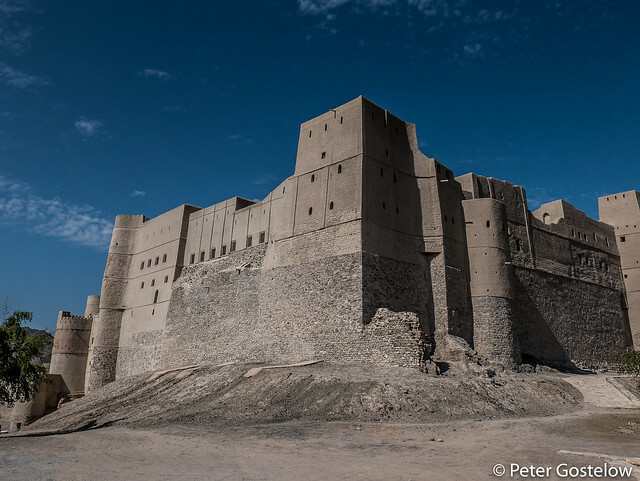 Beyond Nizwa it was onto Bahla, site of another enormous fort. I visited this the morning after being hosted Suleiman, who is a member of the warmshowers website. 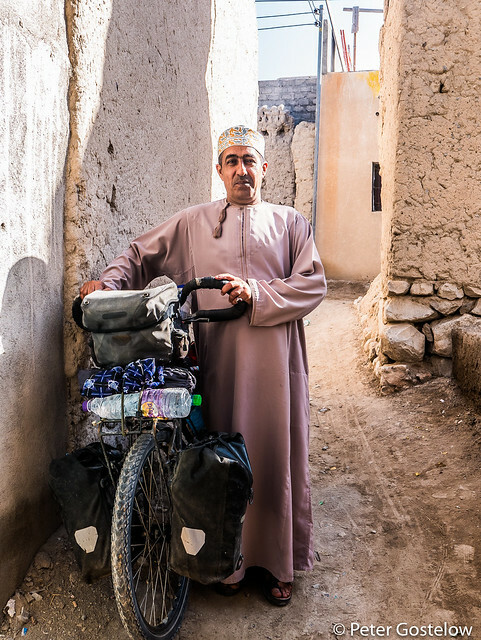 Omani’s with an interest in cycling aren’t very common. 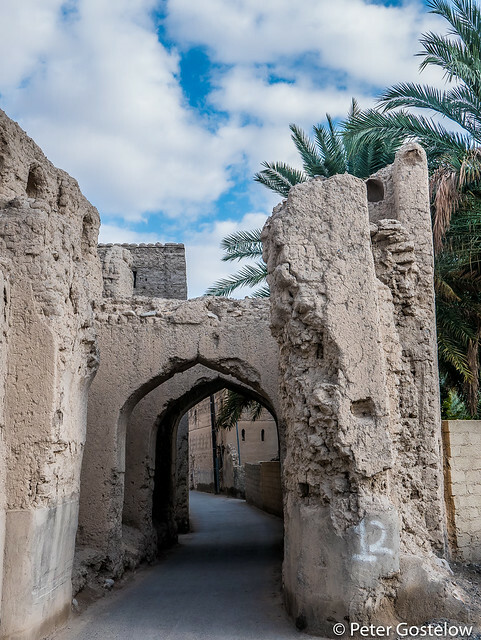 Bahla’s souk isn’t as touched-up for tourists as Nizwa’s. 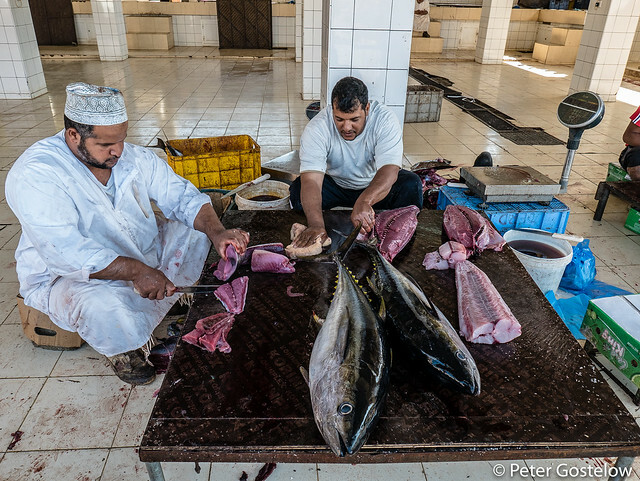 Tuna fish seem to be popular in Oman. Around £5 for a kilo. Shame I can’t buy and carry this on the bike. 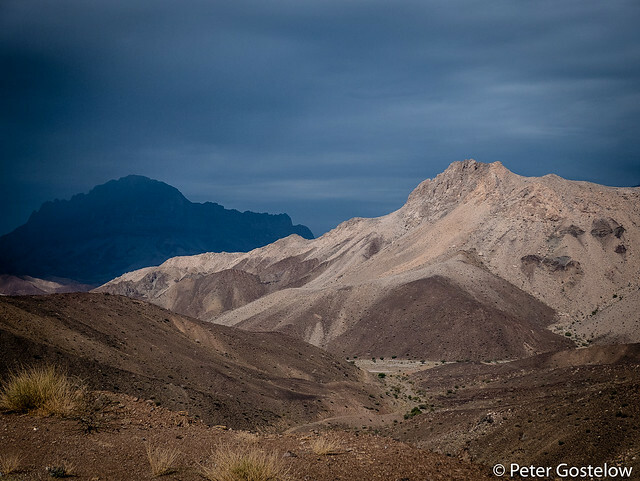 Not far from Bahla and at just over 3000m in altitude, Jebel Shams is Oman’s highest mountain. It only seemed right that I should have a crack at cycling up it, although the road ends at around 2000m, following a steep 15km climb. 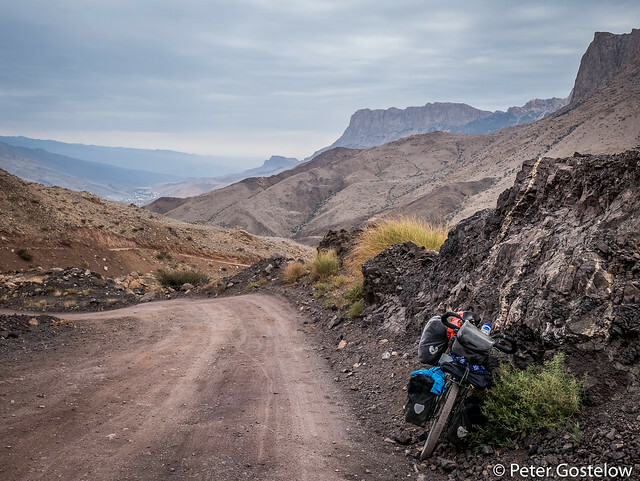 I camped half-way up, left my bags in a cave then continued to the top the following morning, cycling back down and camping in the same place the next night. 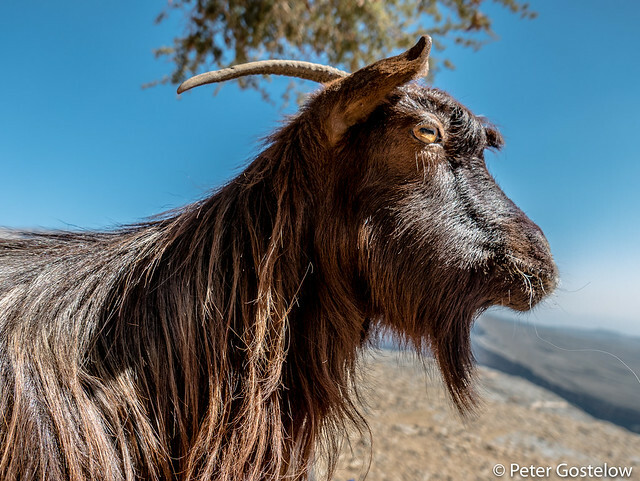 Goats rather than camels are more at home in this mountain geography. 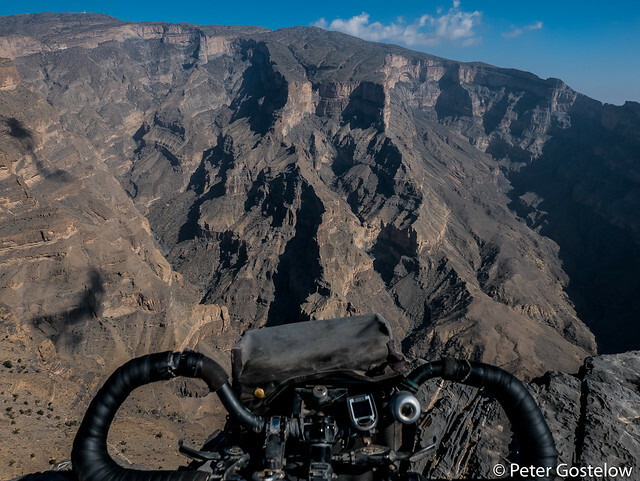 Descending from Jebel Shams reminded me just how steep the gradients in a few places were. Riding a bike weighing 60kg up this is something of masochistic pursuit. As it was on this nearby track, which required some pushing when my back wheel started spinning. 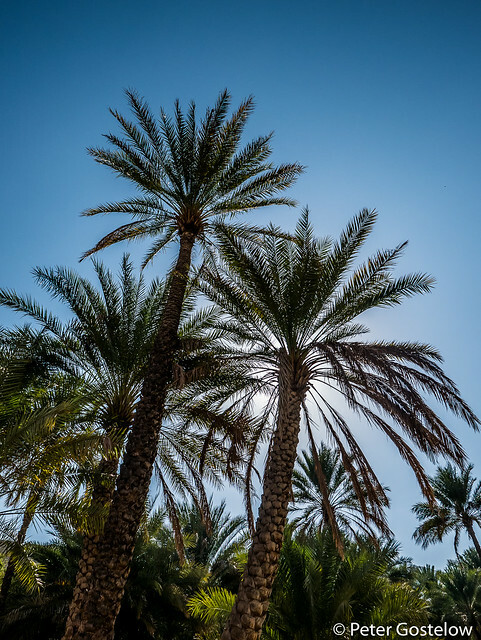 Cloudy skies are rare in Oman. A few spots fell out of these dark clouds, but not enough to stop cycling and seek shelter. 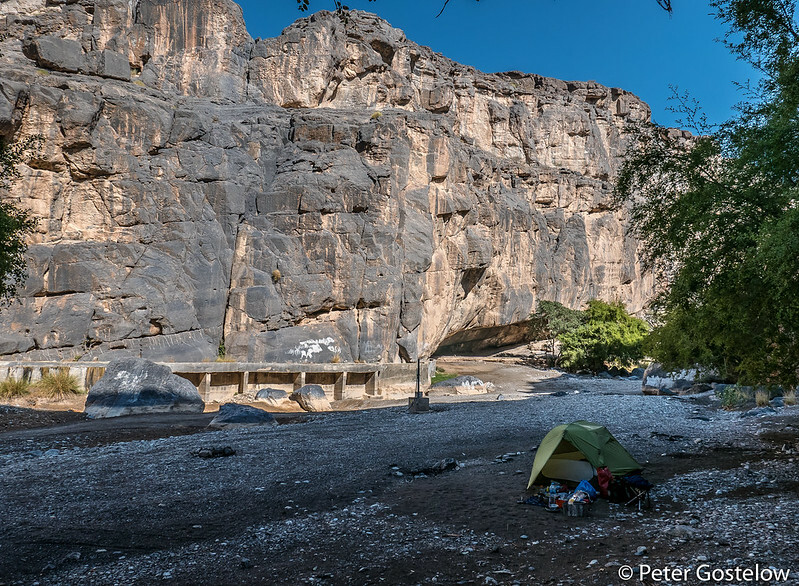 Another wadi and another great camp/swim spot. 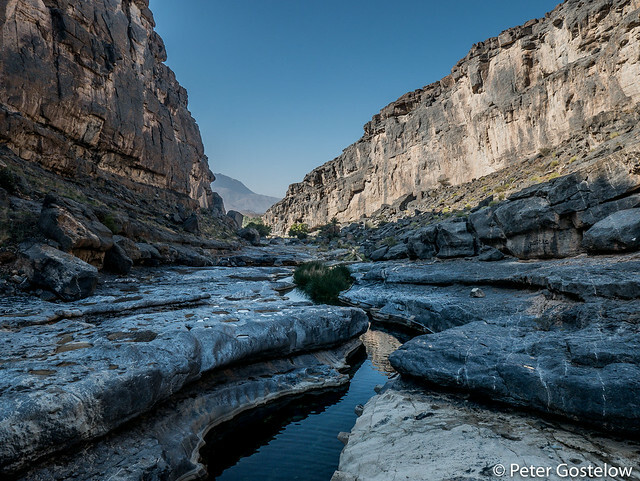 This is Wadi Damm – located towards the western side of the Hajar mountains. 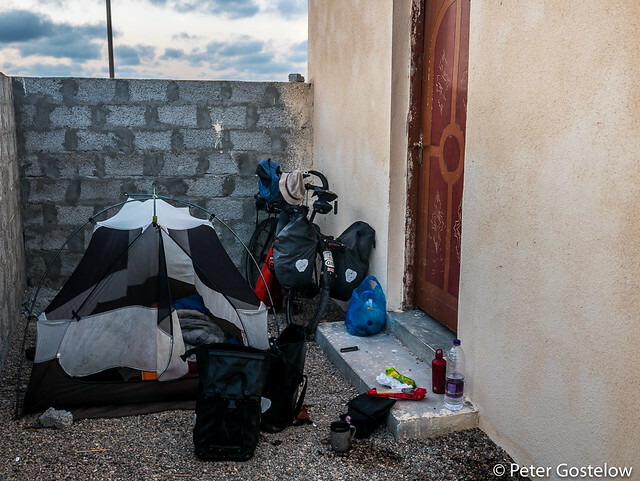 For several days I was joined on the road by a friend who now lives in Oman. This was the first time we had cycled together since I left England and started cycling to South Africa. Some years ago now. Hard to ask for much more than this: great weather, smooth quiet roads and beautiful scenery. 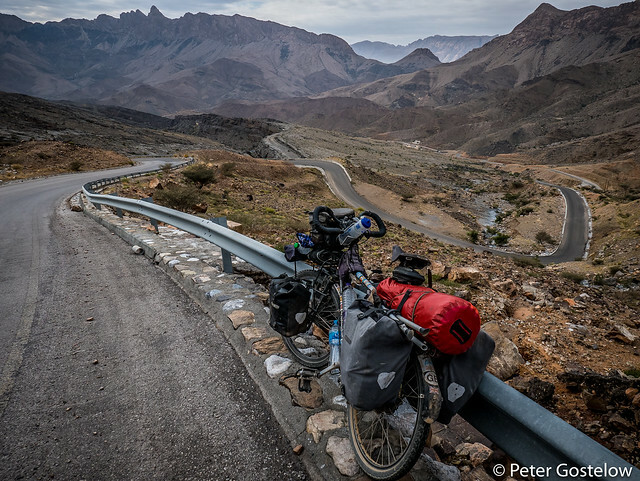 Actually the paved road stopped soon after this – not a problem for me but hard-going on a road bike. More wadi camping. 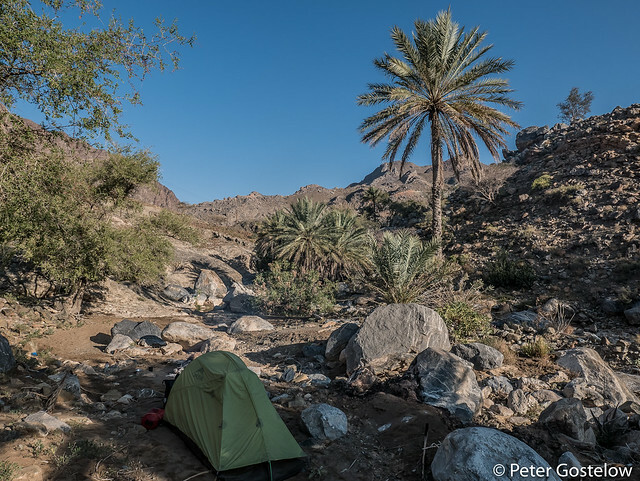 When there is wood, which there often is beside a wadi, camp fires are part of the de rigeur camping experience in Oman, where nights can be surprisingly chilly. 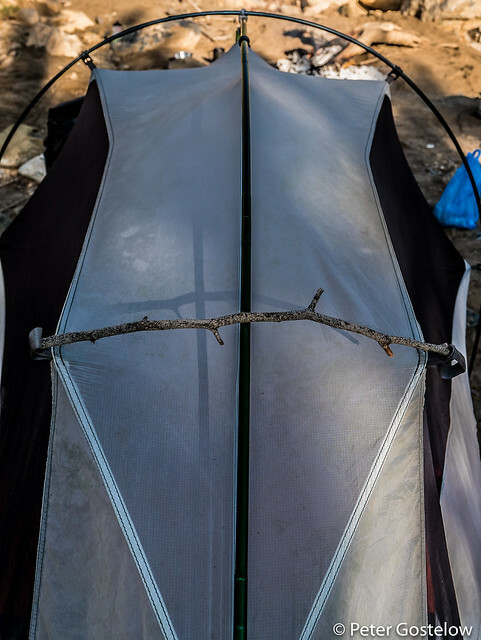 I somehow left behind a tent pole while packing up my gear one morning. Idiot. Fortunately I can improvise with a stick. The constant companion. 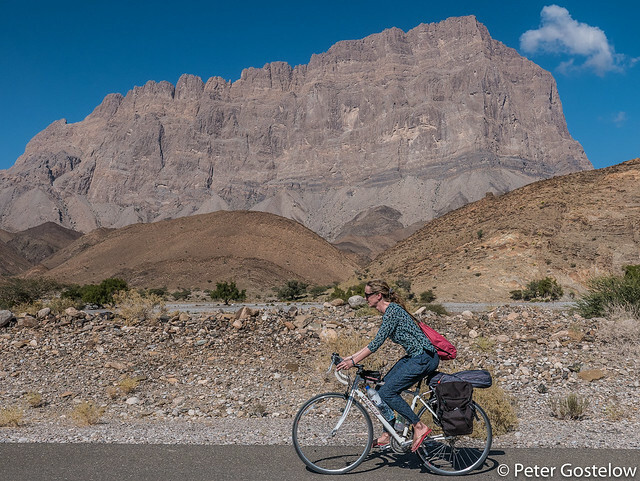 My time spent cycling each day in Oman was rarely very long. This was partly a measure of the sun setting before 6pm and the need to find somewhere to sleep before dark, but also because I was never in a rush to be anywhere, often stopping to charge phone battery for a few hours in a small cafe/restaurant, or look around whatever there might be of interest in the places I went through. 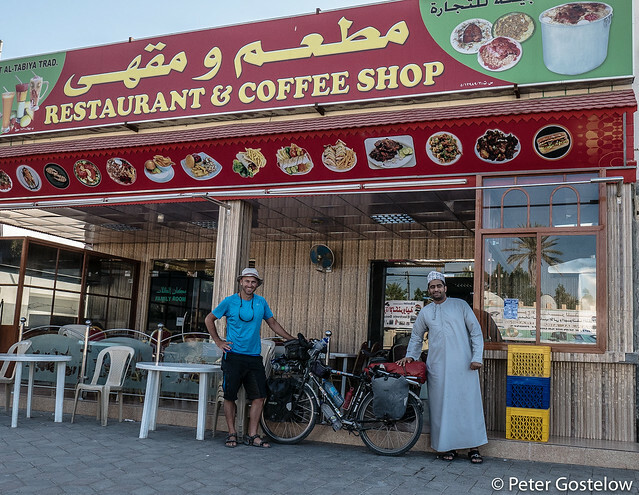 With the exception of one rest day in Salalah I kept on the move constantly for over 5 weeks – typically riding 5-6 hours a day and covering 70-100km on average. Oman is not quite over. This journey is after all entitled Mwanza-Muscat, so it’s the capital I’m headed to next. 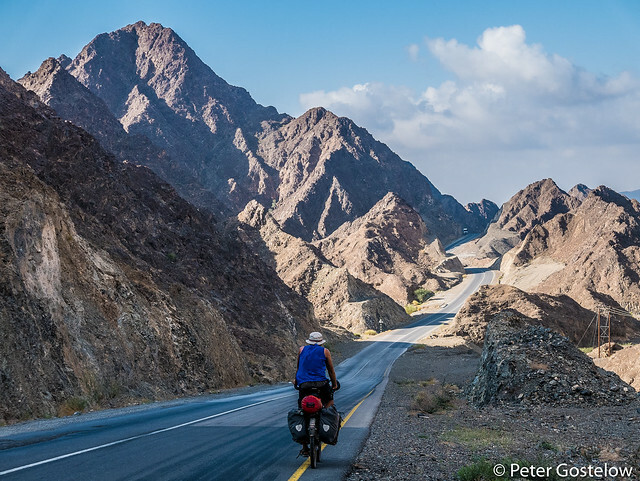 My route through Oman can be viewed at the bottom of this page. 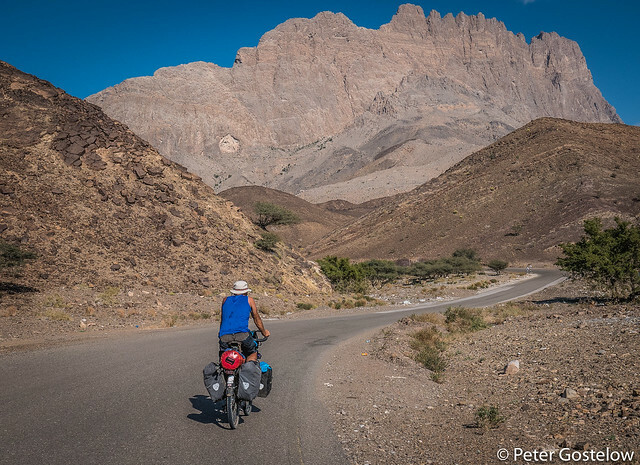 If you have a question about cycling in Oman, or some other aspect of what I’ve covered here, please leave a comment below. 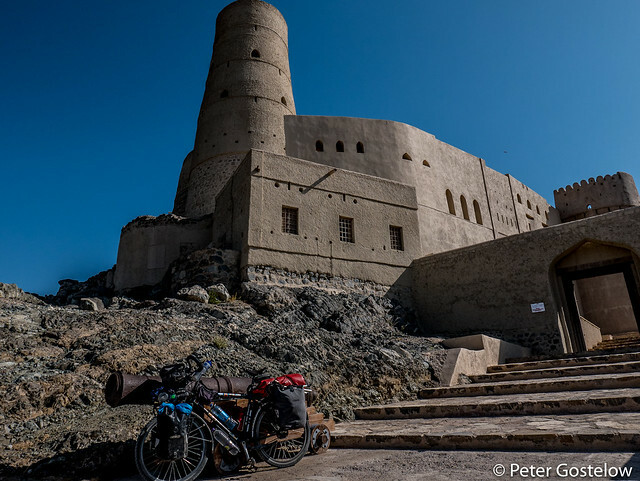 we’re about to fly to Oman and to cycle there (for just 3 weeks). 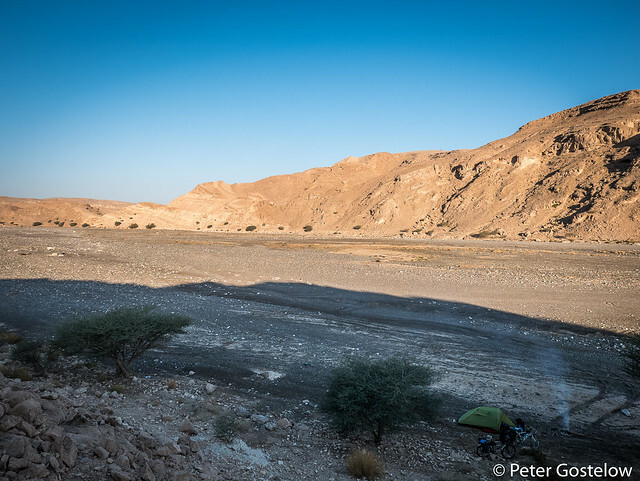 Apparently Oman is a great place to cycle and enjoy outdoor life. 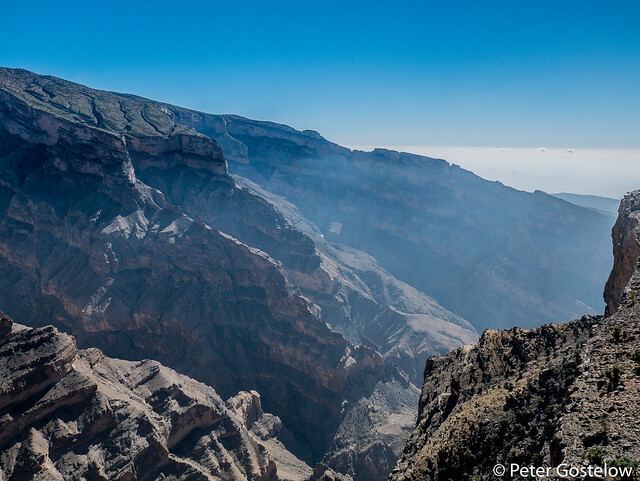 Will you still be in Oman on Feb 14th? Any chance to meet up? 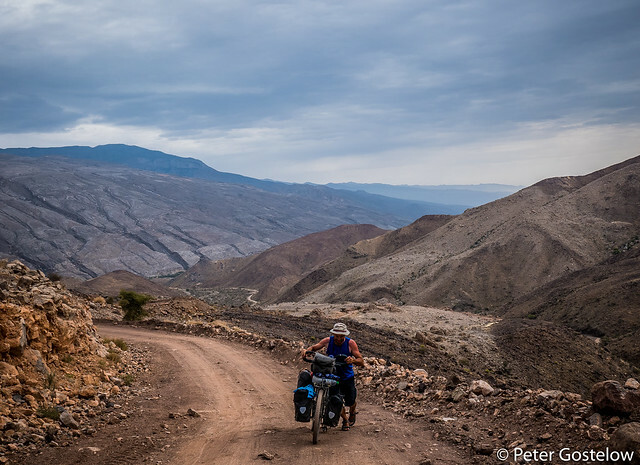 Again amazed by this way of traveling in Africa. 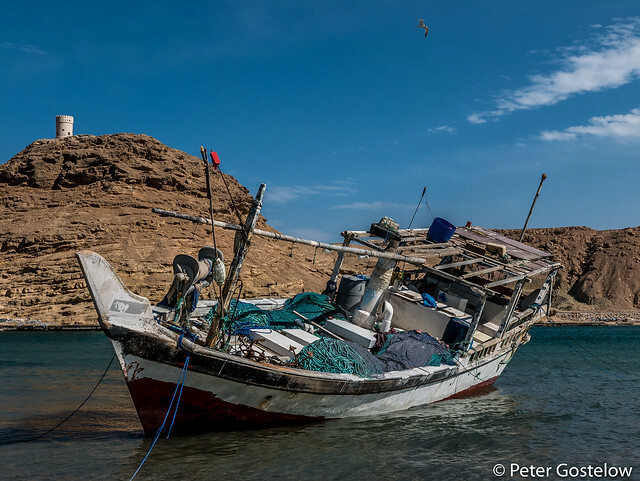 What is there to look if you have everyting on this short coast of Oman? 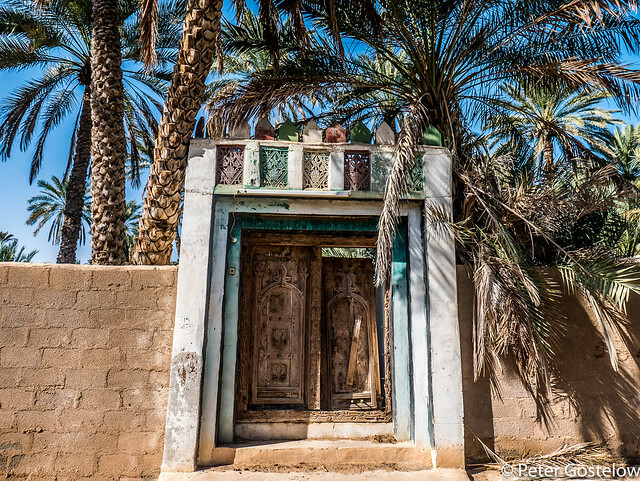 Wonderful job capturing the beauty of Oman. Great to finally meet up after so many years of virtual friendship. 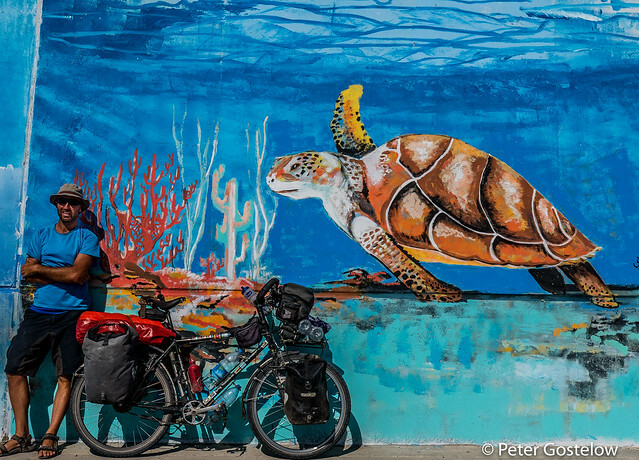 Just hope we’re cycling the same direction the next time our paths cross. Great to meet you both too. 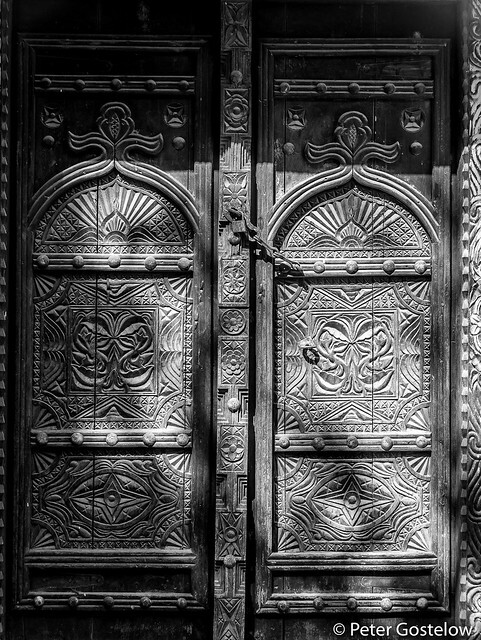 Inshallah we will meet again somewhere on the road. Read this… https://t.co/7Ev89gDwGP another spot for the list…. No, it is not the goal but the way there that matters, and the harder the way the more worthwhile the journey.